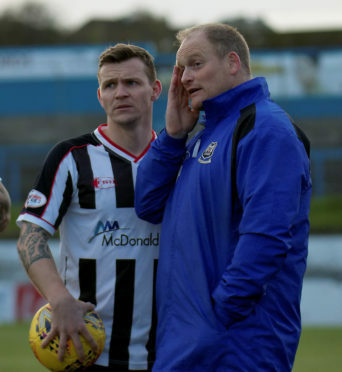 Elgin City manager Gavin Price has urged his players to leave nothing on the pitch as they aim to keep alive their slim play-off hopes against Peterhead today. City must win both remaining games against the Blue Toon and Montrose and hope for favours from elsewhere having slipped to sixth place behind both Stenhousemuir and Clyde. Stenny, who occupy fourth place, are four points ahead of the Black and Whites with a game in hand. Price has urged his side to take care of their own business before looking elsewhere, and he said: “It was a dejected dressing room last Saturday after the 1-1 draw with Edinburgh City, particularly when we heard about Stenny’s late goal to beat Annan. Everybody was thinking that was that but Stenny’s midweek result, in drawing 0-0 against Berwick, still makes it mathematically possible to play for. “Although it’s a slight one, there is still a chance. City are looking to change their fortunes against Peterhead, having suffered four defeats to Jim McInally’s men in all competitions, losing 15 goals without reply. Price, who has Jordan Allan back from suspension but has injury doubts over on-loan St Mirren pair Nathan Flanagan and Andrew McDonald, added: “I don’t think we have laid a glove on Peterhead this season. We have been extremely disappointing in all four games against them.